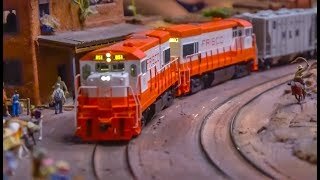 Home Model Trains	Worlds LARGEST model train exhibition! Theme America! Worlds LARGEST model train exhibition! Theme America! About 15.000 (!!!) meters of rails! Incredible LARGE and detailed model train exhibition. This video shows the area of “America”. For more facts (in German) check Enjoy watching!